Musselwhite’s Seafood, voted “Best of Palatka” for many categories, for many years, welcomes you! Yes, Musselwhite’s Seafood located just on the foot of the US Hwy 17 bridge in East Palatka is proud to mention that it has won “Best of Palatka” Readers Choice Award for their food, dining atmosphere, and even catering! “Best Shrimp”, “Best Family Restaurant”, and “Best Caterer” are just a few of the many awards Musselwhite’s Seafood is very proud of. Musselwhite’s Seafood opened in September of 1999, by life-long locals David and Angie Musselwhite. David and Angie met in 1983 while working together at the famous Barnacle Bill’s restaurant in St. Augustine. David worked his way through the kitchen starting as a teenage dishwasher and earned his keep, learning his way around the kitchen very capably! Angie on the other hand worked the front of house learning to manage staff and welcome customers. Over the years, as Angie’s family started Schooner’s Seafood in St. Augustine, David worked closely with St. Augustine restaurateur Chris Way, opening and managing 2 other restaurants in the area. 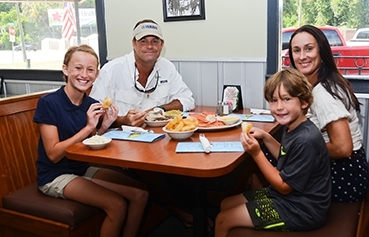 After working and learning the business inside and out for close to 18 years, David and Angie, with children in tow, opened Musselwhite’s Seafood in East Palatka. Locals and guests alike have been loyal. Now, since opening in 1999, Musselwhites Seafood continues to be a favorite among many. Just a short drive from St. Augustine, you can find easy parking and no waits (most of the time) for a table in the dining room or a spot in the bar. All of the food at Musselwhite’s Seafood is fresh to order – all fresh seafood, all fresh produce, and the finest in prime rib, chicken and steaks. David and Angie Musselwhite invite you to join them for dinner or lunch soon. Drive all the way to the Palatka bridge and you’ll easily find Musselwhite’s Seafood. The door is open for you! 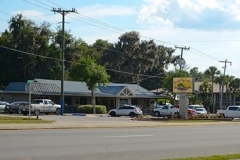 Musselwhites Seafood, 125 US-17, East Palatka, FL, 32131, 386-326-9111.